First revealed back on Feb. 20, Sony’s fourth home console released last week for $399.99, $100 less than Microsoft’s Xbox One. After months of anticipation, next-gen is finally here for PlayStation. The PlayStation 4 looks slick. The PS4 design is a little bigger in size than the PlayStation 3 “Slim” model. It weighs about the same. One side of the PS4 has a glossy finish to it while the other is solid black. There’s a white light going down the middle of the console during normal use. There were reports of the PS4 not getting any video signal because of faulty HDMI ports and the included Sony HDMI cable, so I opted to use one I had already from my PS3. Following an unofficial gaming tradition, the PS4 uses the same power cable as the PS3 Slim model. I have the PS4 on my entertainment center and the cables don’t easily go in or come out like they do on the PS3. This is because the ports are at a somewhat elevated slant, as you can kind of tell from this photo. I have to remove the system from its position so I can actually see where the output is instead of just easily putting the wires back there, which is annoying. In the back of the console there’s outputs for HDMI, an Ethernet port, 5.1 digital optical, a connection for the new PlayStation camera and the power cable. The PlayStation 4 is HDMI only, meaning you’re going to need a television that has an HDMI input to play the system. There’s also two USB 3.0 ports in the front of the console. The USB is where you put the cable for charging the new DualShock 4 controller. Turning on the console makes the same beep noise as the PS3. It’s weird that the PS4 doesn’t have its own unique sound. At first I didn’t know where the power and disc eject buttons were. They’re so tiny. If you have trouble finding them, they’re located down the center of the console, to the left of the USB ports. When the system is turned on, there’s a light running down its center. The light is blue when the PS4 boots up, turns white when in regular use and orange when in standby mode. Setting up the system only took a few minutes and it was ready to go. Connecting the PS4 to the Internet and downloading the mandatory 1.50 Firmware update seemed to automatically be there as I checked out the home menu. Without this update you can’t use many of the system’s key features, like online play, sharing or even watching Blu-rays. The PS4 hardly makes any noise. The only time I notice any sound is when it first turns on, loads up a game or the system’s fans when playing the Killzone: Shadow Fall campaign and online multiplayer. It also gets pretty loud when putting in a Blu-ray or DVD disc and when the movie loads up. During regular use like browsing the home menu or playing a game you can barely hear it. The top of the PS4 console does get warm after being on for a while, but not to the point of overheating. The glossy side of the PS4 is a fingerprint and dust magnet, much like the original 2006 PS3 design was. When setting up your PS4, it asks if you want to make that console your primary system. Making your PS4 the primary system gives benefits to the other users on the console. The sub accounts have access to the PlayStation Plus content of the master account. They can even play online multiplayer, even if their PSN accounts don’t have a PlayStation Plus subscription. This is a great feature, so at least everyone in your household doesn’t have to buy individual PS Plus subscriptions to play online. Setting up a second user account isn’t clear at first. You have to hold down the PS Button then log out of your current account. You can also sign in as a guest, which the system says will delete all data when logged out. You can log into both the PS3 and PS4 at the same time with your PSN account. On the PS3, your PS3 friends will show a different log in date, even though they might be online playing PS4 in that moment. When on PS4 it also shows your PS3 friends using that system’s games. Putting the system in standby mode makes it consume less power and turns it back on quicker. When in standby the light on the PS4 console is orange. In standby things still download and install for PlayStation Plus subscribers. I had the system on standby as it downloaded the NBA LIVE 14 demo. When I resumed to full power, the demo was on the home menu ready to play. The controller can also be charged in standby mode, which you’re going to be doing a lot of. There have been some weird crashes on the PS4. The system gave an error report CE-34878-0, which states, “An error has occurred with the system software” a few times at the same point, when I tried to preview Killzone pictures under my saved applications. The screen went to load the picture, it stayed blue, then the system crashed and an error report came up. Sometimes when checking out the PlayStation Store it would randomly send me back to the home menu. These are the only system-related errors I encountered. Unfortunately I wasn’t able to test out the new PlayStation 4 Camera or connectivity with the PlayStation Vita. The PS3 camera peripheral isn’t supported when plugged into the PS4. The new Dynamic Menu interface on the PS4 is a great upgrade to the PS3’s home screen and looks fantastic. It’s hard to go back to the XrossMediaBar, which Sony has used since the PlayStation Portable release in March 2005. The PlayStation 4’s home menu is much faster and more responsive than the XMB. Moving from different menus on the console is almost instantaneous, unlike on the PS3 where it sometimes moved sluggishly and took several seconds to load the full content. Everything on the PS4’s home menu is easier to navigate and find too. The Dynamic Menu is divided into three sections. The center screen shows a row of all your games, which are now called applications. Going up a level shows the PlayStation Store, notifications. your friends, messages, your profile, Trophies, party chat and the various system settings. The notifications tab shows the system’s downloads, uploads and other messages like game invites. Pressing down while on a particular application at the home menu shows details for each game. Whatever you recently played or watched is at the front of the home menu line. Eventually this is going to become long and disorganized the more games a person plays. Your digital game library is located all the way to the right on the home menu. This only shows any installed downloadable games and add-ons for disc-based titles. Watching entertainment apps like Netflix or Hulu Plus are under their own “TV & Video” tab. With them on, you can go to the PS4 home menu and into the Store or start playing a game. Starting a game closes the entertainment app though. You can suspend the game, start Hulu Plus again, then end Hulu and go back to the game at the same point it left at. However this only goes one way, since if you go to the television app again it starts over from the beginning. The menus for apps like Hulu Plus are about the same as they were on PS3. When watching a DVD or Blu-ray, the PS4 makes a lot of noise when initially loading the disc. Sometimes DVDs don’t look that good on the PS4. I tested a couple of movies and they all looked grainy and low quality. When I first put in these DVDs, it didn’t appear to be upscaling them correctly like on the PS3. DVDs on the PS3 looked sharper and even sound better. However when I tested the same movies again the next day, they looked greatly improved on PS4 from the first time I played them. Perhaps the first test was an anomaly, but it’s something still worth noting. Blu-rays on PS4 looked about the same as they do on the PS3 player. The menu when watching a movie is a bit different than it is on PS3 too. It will take some time to adjust to the new layout. Each game on the home menu has an Overview and Recent Activities tab. The Overview, as you can see here, shows details like your Trophy count, game info about downloadable content, news and who of your friends plays that game. Activities for each game show all the latest actions from both you and your friends, from unlocked Trophies, shared media, or high scores in games like Resogun and online challenges completed in Killzone: Shadow Fall. It won’t show any of this information if you’re not signed into PSN though. This is a cool feature that plugs into the PS4’s social ecosystem and further connects your games with all your friends. You can also see what each game update fixed or added by pressing the options menu when highlighting a specific game. There’s no customizable themes like on PS3. Right now you can’t even change the blue background color either. The main menu audio effects sound gloomy after a while, which you also can’t change. When unlocking a Trophy, you have to go the notifications tab or the Trophy menu and wait for the server to sync your collection instead of just pressing the PS button to see its details. This is a minor inconvenience, but it’s odd that Trophies still don’t instantly appear on your profile like they do on Xbox Live. Trophies now have a new rarity level to them, from common, rare, very rare and ultra rare, as you can see here. Each Trophy shows the percentage of other PSN users who earned it too. These rarity levels also show for PS3 games under your Trophy list when looking at them on your PS4. This is a cool addition for people even casually interested in gaining Trophies. The Trophy section also splits them into different sets for downloadable content, as you can see in this image. This menu is so much better instead of having to continually scroll down like on PS3 to find the additional DLC Trophies. On the PS4 it also separates different sets for PlayStation 3 games. Comparing Trophies with your friends is much faster on PS4 and almost instantly loads all your games. This is a great and smooth improvement over the delayed length it took for each set to load up on the PS3. which would sometimes not even allow you to back out of the comparison when you wanted to. Surprisingly voice commands can be used even without the PlayStation camera. By plugging a headset into the DualShock 4 and saying “PlayStation,” you’re given options to control the home screen with your voice. You can say the name of a game and the PS4 will automatically move over to that title on the home menu. Saying “Start” will launch that game. In Shadow Fall and other games you can say “PlayStation” and then either say “Take Screenshot” or go back to the PS4 home screen. Even if you’re in a game and return to the home menu, the voice commands still work. Saying “Power” takes you to a menu where you can say “Enter Standby Mode” or “Turn Off PS4” and the system will answer your order. Gameplay voice commands in titles like NBA 2K14 work without a camera too. Using the Xbox 360/Xbox One Kinect voice command prompts like “Time out,” “Intentional Foul,” “Isolation” and “Switch Camera” all work on the PS4. There are problems with voice calls in the game though. Sometimes the words don’t even register. Once “Time out” called for a pick and roll. It’s either the game’s voice commands aren’t that responsive or they’re the wrong words. These are limitations to these PS4 voice command prompts. Voice doesn’t work in all games or areas on the home menu. You can’t eject a disc or close an application with your voice. Voice commands don’t answer to only part of the title. You can’t just say “Ghosts” or “Shadow Fall.” You have to say the game or application’s full name (“Call of Duty: Ghosts”) to jump over to it. Oddly the only game where saying the subtitle worked was Assassin’s Creed IV: Black Flag. Just saying “Black Flag” switched to the game. Saying “PlayStation” on the home screen of games depends on what third-party title you’re playing. It wouldn’t work in Battlefield 4 and when back at the PS4 home menu after pressing the PS button, voice commands wouldn’t work while the game was suspended. The same went for NBA 2K14, even though in-game it has voice commands and listens for them. These voice commands also don’t work in pausing movies or entertainment apps. Going to the “TV and Movie” tab with the voice command and then saying “Netflix” won’t start the app. You have to use the controller. You can’t say “PlayStation Store” to go into it either. You can access the game library tab with your voice but can’t launch individual games from there with voice commands. Even with its limitations, it’s surprising how well voice commands work on the PS4 and that Sony isn’t promoting this feature more, considering the Xbox One costs $100 more to partly have this feature. The problem with voice commands is exerting energy by continually saying a word or phrase, sometimes multiple times, when you just want to relax and wind down. If Sony can increase the scope of these voice commands through firmware updates it could close the gap between Microsoft’s Kinect-focused system in this area. The PlayStation mobile companion app on an Android or iOS device lets you type with your phone instead of using the controller’s input. It has to be synched to each individual user account on the system to work. Within the app you can check updates from your friends, send messages to people and look at Trophies. You can also buy content from the PlayStation Store that will be downloaded to your console when its powered on or in standby mode. The PlayStation app is a good second screen option for what it does. The PS4’s Dynamic Menu isn’t as impressive or deep as the way Xbox One’s new dashboard is supposed to work, but it does its job well. The home menu is kind of bare bones, but in a good way. It’s simplistic and doesn’t frustrate or obstruct people from playing their games and accessing their content. The DualShock 4 controller gels right into your hands. The material used for the back of the DualShock 4 is different than Sony’s three previous generations of controllers. It feels much more comfortable than the DualShock 3. It’s a major improvement over the PS3 and a superior controller. With the different backside design, the grip on the controller is terrific. The DualShock 4 is bigger than the PS3 controller too but still maintains the same shape and overall design. Rumble feedback from the controller is more precise, coming a lot more from the handles. Dribbling the ball in NBA 2K14 gives a slight rumble feedback through the controller that adds a lot to the gameplay. Overall it offers much better feedback than the DualShock 3. The thumbsticks are smaller and feel like they’re made from a slightly different material than the DualShock 3’s. These new sticks also have a small circular trim that adds more precision. They work well when aiming in a first-person shooter or holding it down to run. The directional pad on the DualShock 4 is also slightly different, giving a stronger input than the wobbly pad on the previous controller. The DualShock 4’s triggers are another great improvement. The L2 and R2 buttons are a bit longer, more concave shaped than squared. When pressed down, it feels like it’s actually pushing into something rather than the “floaty” feedback on the DualShock 3. Your finger rests easier on the edge of the DualShock 4’s triggers because of their added length and different shape. The design also allows for much faster and repeated inputs than the DualShock 3 does. These new triggers are just better than the DualShock 3’s and first-person shooter fans will appreciate the controller’s new layout. A new addition to the DualShock 4 is a light bar on top of the controller. This light bar goes blue for most use, as you can somewhat see in this photo. When in standby mode it turns orange to correspond with the system’s light. The light bar sensor is also used to track movements with the PlayStation 4 Camera. This light bar can’t be turned off or disabled. Sitting on my couch several feet away from the PS4, I didn’t notice the light reflecting off my television during gameplay at all. It could be a minor distraction depending on what your TV set up looks like. When in a game like Killzone: Shadow Fall, during the campaign the light bar glows green when in good health, yellow when getting shot at and flashes red when you’re about to die. It doesn’t do this for the game’s online multiplayer. A third-party game like Call of Duty: Ghosts doesn’t have this feature at all. It’s going to be up to the developers to incorporate the light bar into gameplay. This is actually a neat feature that could add some depth to certain games, depending on where the developers take it. For someone who has used the original PlayStation controller design since the late ’90s, it took a few hours to get accustomed to the new size of the DualShock4 and placement of the Option and Share buttons. For the first time since 1997 when Sony introduced the DualShock, there’s no start button on a PlayStation controller adjacent to the square button. With my muscle memory, I kept slightly missing the new location of the Options button but shortly got used to it. The touch pad on the front of the controller is another new addition. The game that made the best use of the touch feature is Killzone: Shadow Fall. In the campaign you call up a drone named OWL and its abilities like shooting enemies, shocking them or giving you a zipline by pressing in a certain direction on the touch pad. For other launch games though, the touch pad only does extremely minor things during gameplay, like accessing the options menu. In Assassin’s Creed IV: Black Flag pressing the touch pad pulls up the world map. In Killzone’s multiplayer, you can press it to see a list of the player scores in the game and other details on the match. For other games like Call of Duty: Ghosts, it doesn’t do anything in the campaign but in online multiplayer it will show the full list of players and their scores on the screen’s top right corner. The touch pad doesn’t work on the PS4’s home menu at all. Hopefully the touch feature doesn’t become an afterthought. Another new feature of the DualShock 4 is that sound comes from the controller’s front speakers during certain games. Collecting audio logs in Killzone: Shadow Fall will play them through the controller, gathering orbs in Knack will sound them being absorbed and alerts from Resogun inform you about power ups or warn of dangers on the stage. The audio quality is excellent and doesn’t distract from the game. One downfall of the new controller is its short battery life. The battery doesn’t last as long as the PlayStation 3’s. The DualShock 4 only goes around 7-8 hours before the system gives you a warning that it’s needing a charge. This isn’t enough time for a next-generation controller. It felt like I kept needing to charge it. You can charge the controller in standby mode, which uses less power. A great feature that hasn’t been really promoted by Sony is the ability to plug headphones into the controller’s 3.5 mm headset jack. This makes the game’s sound come through them. This is done by holding down the PS button and going to the “Adjust Devices” tab. I plugged in some cheap headphones that I use for my phone and games still sounded great. Playing a game while listening through headphones brings out more of the environments and gameplay. Each PS4 game needs to be installed to the hard drive in order to play. The console’s hard drive has 500 GB of memory. The game install sizes are massive. Of the games I tested, Knack is 36 GB, Killzone: Shadow Fall is 39 GB, Call of Duty: Ghosts is 33 GB, Battlefield 4 is 35 GB, Assassin’s Creed IV: Black Flag is 21 GB and NBA 2K14 is a whopping 46 GB. Game patches are automatically downloaded and installed, unlike on the PS3 where you needed to start each game if you didn’t have PlayStation Plus. For PlayStation Plus subscribers the system downloads and installs game updates or content when the PS4 is in standby mode. System firmware updates are downloaded automatically but need to be manually installed from the Notifications tab. A new feature of the PS4 is to ability to still play games even as they download, get patches or install. This goes for both retail and digital games from the PlayStation Store. As Battlefield 4 installed, I couldn’t do any online multiplayer but the campaign was open. When NBA 2K14 installs, it puts you in a quick game of the Miami Heat vs. the San Antonio Spurs, the two teams from this year’s NBA Finals. These game patches and installs take several minutes to finalize so it’s nice to be able to jump right into the game. The speed of downloading these game updates is also going to depend on how good your Internet connection and service is. They’re a lot faster than they were on the PS3 though. There’s also a noticeable difference in the time it takes to download a system firmware update, which is cut down by several minutes. These patches and new firmware releases were always one of the worst parts about the PS3, but Sony appears to have alleviated the misery of updating your games and system on the PS4. With only six retail games, five digital games, a demo and one entertainment app on my PS4, it all takes up 277 GB of space on the hard drive. My application save data takes up 295 MB. There’s close to seven gigs of captures on it too. All that’s left on this PS4 is 173 GB of free space. This is going to be a big problem in the future. While the PS4 supports swapping out its hard drive for a bigger upgrade, it doesn’t support external drives. It’s annoying to have so much space taken up only a few days into the console’s life, especially when games like Knack still have loading times. Like on the PS3, PlayStation Plus uploads game saves to the cloud for 1 GB of storage. However PS4 saves take up a lot of space, way more than PS3 games. PS3 save data for games like Grand Theft Auto V takes up 317 KB of space, while The Last of Us uses 336 KB. Meanwhile on the PS4, games like Knack and Killzone take 11 MB each. Not even early PS3 titles came close to these sizes. The PlayStation Plus cloud storage size isn’t going to be enough. I already have 305 MB of save data used after the console’s first week. As more and more games are released and digitally downloaded through the PlayStation Store, people are going to quickly run out of space on their hard drives and cloud storage. There were launch woes during the first two days of the system, with the PlayStation Network down, the Store not opening and online multiplayer not connecting, but PSN works well now. Playing online multiplayer requires a PlayStation Plus subscription on PS4, which costs $50 a year. It was free on PlayStation 3 (and still is). It’s disappointing that online multiplayer is now behind a paywall since that was always one of strong points PSN had over Xbox Live. With the massive improvements Sony made to PSN since the launch of the PS3, it’s about even with Xbox Live now that users finally have cross-game party chat, a feature that is sorely missing on the PS3. PlayStation Plus’ monthly free games have consistently been high quality, but now that the PS4 does automatic patch downloads and Trophy syncing, Sony will eventually need new ways to innovate the service. If it doesn’t, PlayStation Plus will stall out the same way Xbox Live has done the past few years. The two titles of the Instant Game Collection for PlayStation Plus on PS4 are Resogun and Contrast. The free-to-play games like DC Universe Online, Blacklight: Retribution and Warframe don’t require PlayStation Plus to play, although the Store page for Warframe says it required PS Plus for online multiplayer. Unlike on the PS3, there’s no notifications when a friend signs on to PSN. You have to manually go to your Friends list and check who is online. While it’s understandable considering the increased friend limit to 2,000 people, there should still be a way to know when close friends sign on so you can send them invites and play games together. Each console also comes with an insert for a free 30 day trial of PlayStation Plus, $10 PlayStation Store credit and a 30 day trial of Sony’s Music Unlimited program. Getting the free 30 days of Plus does require you to put in your credit card information though. The PlayStation Store only has PS4 content to check out and buy. Demos are hard to find in the Store and are slim choices, which makes it hard for people to test games themselves before buying one. As of this posting, the only games in the Store with demos are NBA Live 14, FIFA 14 and Trine 2: The Complete Story. Getting the free $10 Store credit was another good move by Sony to get people spending more money, but there’s only a couple downloadable games in the $10-20 range right now, like Sound Shapes, Super Motherload, Flower, Contrast and Resogun. The PlayStation Store still feels sluggish. It’s using the recent redesign from the PS3 version. The Store on the PS4 is quicker than PS3, but aspects like searching for games or switching between different menus doesn’t feel completely right. Visually it looks great but the actual response times still aren’t there yet. After seven years, you still can’t change your PlayStation Network ID, something you’ve been able to do on Xbox Live (for a fee) for years now. For the foreseeable future you’re stuck with that dumb screen name you made as a teenager. Another missing feature from the PS3 is you can’t set your PSN status to unavailable or leave a comment update above your profile for your friends to read. The bundled mono headset feels cheap. This is an official image from Sony. This is how it looks out of the box and up close. Both the physical and audio quality of the headset isn’t good. The earbud always feels like it’s about to fall out when I’m playing games. To change the headset volume, you do it by holding down the PS button and going to the Adjust Devices option. Even with the volume at max I can’t hear other people online that well. Their voices sound quiet and often muffled. When doing a live gameplay stream, the viewers couldn’t hear me that well either. Bundling the console with a free headset was a great way to build a better PSN community where people actually talk during games, but it’s just not at the quality level it needs to be to make that happen. The official PS3 Bluetooth headsets don’t work, but some USB headsets that plug into the system or controller are compatible with the PS4. At least through the official headset, voice commands don’t automatically register in NBA 2K14. This was the only game I had problems with. I had to continually repeat the same phrases until it went through. I’m not sure if it’s because of the headset or NBA 2K14. Most other games and especially the PS4 home menu picked the commands up right away, registering about 98 percent of the time. The PlayStation 4 headset is a big let down. It functions but won’t be suitable for most people who heavily play online games. The PlayStation 4 is built around sharing moments with your friends and being social. To start off, you can log in with your Facebook account that will show your Facebook profile picture and name under your PSN profile. Even if you don’t connect to Facebook, the PS4 shows whatever name you used at the setup on the home menu. This is only viewable by the current user unless you send or receive real name requests from people on your PSN list. This is a great feature to remember who certain people are that you know in real life, met in a game of Call of Duty or through an online message board. Under the “What’s New” tab on the home menu is a collection of everything you and your friends are doing on PS4, which shows the Trophies earned, games played or if someone broadcasted a game. It wasn’t loading for me the first few days after the console released but now is working fine. Each update can be selected to look at for further details in full screen. Some games also do a mini-version of this feature. In the main menu of Killzone, it will show updates from you and your friends about the latest accomplishments and new personal bests, such as a game where they set a kill record or scored a lot of points in a single game. These also show up under the What’s New tab on the home menu. The What’s New section could become a jumbled mess when more of your friends start buying PS4s. There doesn’t appear to be an option to turn off sharing every time you play something, so a lot of the updates are just from people starting a game. With a new 2,000 friends limit, there’s going to need to be some sort of list feature to organize through all these updates or sorting it by a specific game. Having the Share button built right into the controller was a smart move by Sony. It’s working almost flawlessly and is going to change the way people interact with games. Taking screenshots is done by pressing the Share button and then going to the upload screenshot menu, or by holding down Share for a few seconds to automatically grab it. The PS4 records 15 minutes of gameplay for each game you play and every game clip stays on your hard drive until deleted. After watching clips online and sharing my own, it definitely could be one of the defining aspects of this new generation. Editing a video clip is incredibly easy and takes only a minute or two. You select the start and end point of a clip and then the system trims it for a final version. That’s it, and the clip is shared. It takes several minutes for the larger video files to appear on your Facebook profile, but screenshots are there right away. Recording pauses when sensitive information is up on the screen, like in Knack when collecting items and it shows your PSN name and your friends who collected the same item. However it doesn’t do the same during Battlefield 4’s in-game menu that shows your PSN name or the Killzone main menu that shows your friends list. It does block sensitive info when broadcasting live on Ustream or Twitch, temporarily pausing the stream. If you’re streaming, it won’t simultaneously save the 15 minute clips like it automatically does when normally playing. Currently sharing images and gameplay videos is limited to Facebook and Twitter. Right now there’s no Google Plus or YouTube support. Here’s what it looks like when you share to Twitter. This is a screenshot upload to Facebook and a photo album of PS4 images too. You can put your own message or description for each upload. Right now you can only share videos to Facebook. Here’s a video of the campaign from Killzone used with the Share feature. For some reason there’s no sound when recording or streaming NBA 2K14, like in this video. You can choose who on Facebook gets to see your shared content, like certain groups of friends or networks. I wasn’t able to view clips or screenshots by my friends that appeared under What’s New. This could be due to some privacy settings they selected or the section not working right. This is how it looks in full screen when you click on a What’s New update further. From your friends list you can’t see any of their shared past or present content, which should be something that’s there and is another odd exclusion at launch. In the System Storage Management under Settings, you can look at all the captures for each game on the hard drive. From here however, there’s no way to quickly upload a screenshot (or even multiple images). You have to hit the Share button, pick Upload Screenshot, and then search for the one you want. In pressing the Share button though, it makes a capture of whatever menu you’re on, leading to a lot of unnecessary images. The right way to do it is by uploading them from your profile tab. Under your profile picture will be a small folder icon that says Captures. Here you can upload any video clip or screenshot by highlighting it and then pressing the Share button. All these recorded videos are going to take up a lot of hard drive space. Broadcasting live gameplay on Twitch or Ustream is another key feature of the PS4. There’s a “Live from PlayStation” tab where you can watch other people play from their streams. The rooms with the most current views are at the top of the menu. Games are searchable there, so you can find a specific stream to watch. You can also watch PS4 streams from the Twitch website. When streaming you have the option to include just voice, voice and video from the PlayStation camera or neither of these options. Streaming can be done with a full screen or with a chat room below the gameplay to see what people are saying. The quality of your stream is going to partly depend on your Internet’s upload speeds. Here’s one of the ways it looks when watching a stream from the PS4. The stream can be put in full screen too. If you’re viewing one in full screen on the PS4, the person’s face will be in the top right corner. It takes a few seconds for the video quality to buffer. You can input chat to interact with the streamer. Chatting from the Twitch website will show within the stream on the PS4 console too. Streaming on PS4 could use a few small additions. Unfortunately notifications don’t pop up when a friend starts live streaming, so you might miss their videos if you’re in a game. From Live from PlayStation there’s no follow option to keep up with someone and know when they’re streaming again. You also can’t tell how long a person has streamed to see if that would be a better room to watch. Playing with the chat open shrinks the gameplay and makes it hard to see what’s going on, which hurts the experience for the streamer. A companion app where you can see feedback would work better. Twitch integration on PS4 works fantastically. It should potentially win a lot of people over to using the feature. Streaming is going to be huge because of how simple Sony made it for every user to do. You’ll be able to check out games your friends are playing, judge a game before buying it or build communities around each game. While there will be potentially thousands of people streaming the same game, each person could build their own following. There’s going to be a lot of crap but also many entertaining and informative streams. Sharing and streaming can be done without a PlayStation Plus subscription, so everyone on PS4 can experience it. You can subscribe to Quarter Disorder’s Twitch page to watch future streams. Ironically Twitch streaming is delayed on the Xbox One until early 2014 and won’t be a launch feature, even though Microsoft announced a Twitch partnership before Sony at this year’s E3. Currently it’s not archiving PS4 live streams on Twitch even if that option is selected under your Twitch user settings. Even if you’re not into having a Facebook account or being on Twitter, it’s still a cool option to have memorable gameplay and pictures saved on your system. The ability to so easily stream games online could be one of the next major evolutions of console gaming. For those skeptical about the PS4’s sharing features, experiencing it for yourself instead of only reading about it might change your mind on its potential usefulness and impact. The full launch lineup features 23 PS4 games. There are only three real PlayStation 4 exclusives, those being Knack, Killzone: Shadow Fall and Resogun. With Watch Dogs and Driveclub delayed into 2014, there’s a sort of emptiness to the PS4’s launch games list. Most of the lineup comes from third-party developers and publishers. As much as Sony pushed independent developers and games throughout this year, there are only a few indie downloads at launch. The games on PS4 do look next-gen though. You can easily tell the differences between the PS4 and previous console. Even with the cross-gen games that are both on PS3 and PS4, the PS4 release is the definitive version. Assassin’s Creed IV: Black Flag looks awesome on the PS4, especially after Ubisoft patched the game to be 1080p with update 1.03. Killzone: Shadow Fall’s multiplayer is fantastic. Game modes like Classic Warzone can go for 20 minutes with changing team objectives throughout the match. 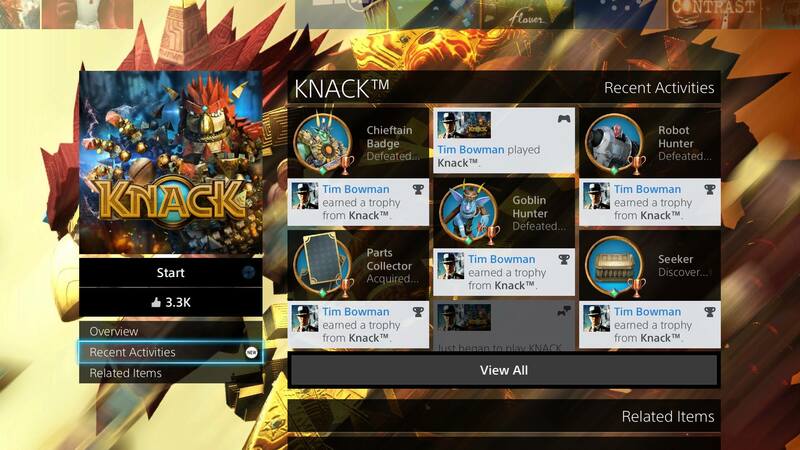 Knack follows Sony’s traditional platformer model. Visually it looks terrific and is a good game for young kids and families. Resogun, a dual-stick shmup by Housemarque, is an awesome title that you can play for 10 minutes or an hour and still be satisfied. Quarter Disorder will be posting more detailed impressions on some of the launch games shortly. One thing to note is that if you’re looking for an online multiplayer shooter, Battlefield 4 is completely broken on the PS4. Don’t buy the game! I played the game for the first time on Nov. 17. I couldn’t get into the 64-player Conquest mode but still could play a few other online modes (that weren’t full either). When I started the game the next day an error message instantly appeared on the screen saying my save file was corrupt and to continue on it had to be overwritten. I lost about an hour of the single-player and then couldn’t get past the main menu without the game constantly crashing to the PS4 home menu, giving an error report of CE-34878-0. Even after a recent patch the Conquest mode is still hit and miss, sometimes refusing to load into a game, and there are still people getting corrupted save files. Until DICE and Electronic Arts put in major fixes to Battlefield 4, it’s not worth wasting money on. There’s probably many people who spent close to $500 buying a PS4 and Battlefield 4 as their only game and now can’t play it or enjoy the console. How Battlefield 4 even got released in this state as a launch game is shocking but ultimately not surprising coming from a company like EA. The PS4 is an impressive piece of hardware. The new UI works extremely well and there’s room for a lot of additions and improvements, not only during the console’s lifespan but in the next 12 months. Considering how well Sony has done in getting gamers behind the PS4, it’s almost unbelievable that this is the same company that released the $600 PlayStation 3 in November 2006 and lost its dominance from the PlayStation 2 era in the process. When Sony revealed the console back in February, it told everyone to come and see the future. Playing the PS4, you can see where the future is headed. The PS4 doesn’t feel like the same leap from the original PlayStation to PS2 or PS2 to PS3. The true next-gen feature at launch is the console’s social aspects. Streaming and sharing game moments could be one of the defining features of this new console generation. One of the other defining features of the PS4 will be the way developer’s take advantage of the console’s powerful hardware to create unique and amazing experiences, like we saw on the PS3 with Naughty Dog’s The Last of Us. The PS3 and PlayStation Network went through massive changes during the system’s lifespan. For almost the first two years of the PS3, it didn’t even have in-game XMB access. Who knows where the PS4 will be in a few years. Features like playing MP3 files, DNLA media server support, YouTube sharing or suspend and resume aren’t there at the PS4’s launch. These missing features should be the ones that are added in the next few or several months. As of now there’s not a defining PS4 game, but there still are several quality releases to choose from. Currently there’s enough to hold people over until next year, especially with the third-party games. For $400, you’re not just getting the current offerings but also buying into the future. With inFamous: Second Son from Sucker Punch releasing March 21, 2014, The Order: 1886 in 2014 from Ready at Dawn Studios and Naughty Dog announcing a new Uncharted game, there’s a lot to look forward to on the PS4. Games on PS4 should be more detailed with 1080p resolution and delivering better gameplay experiences running at 60 frames per second. Sony’s focus on indie developers and fresh, new games should bring exciting titles to the console that you might not find on the Xbox One or Nintendo Wii U. If you wanted to jump in right now, the PlayStation 4 is a good choice to make for next-gen.